What is your business model in the arts? Douglas McLennan talks about the new Attention Economy in this insightful article. "10 new partners on ArtBabble.org. That's right, the ArtBabble family just got bigger: Art Institute of Chicago, KQED, Museum of Arts & Design, Museum of Contemporary Art San Diego, Norman Rockwell Museum, Rubin Museum of Art, San Jose Museum of Art, The Solomon R. Guggenheim Museum, Van Gogh Museum, and Yerba Buena Center for the Arts." an agency supported in part by the National Endowment for the Arts. The DC Advocates for the Arts are fighting against the cuts in the local arts budget. Please sign the petition letter below, and ask your networks - artists and arts organization folk - to sign on. Even if you are not tagged in this note, please add your name, affiliation, and the ward(s) in which you work as a comment here [note - this is a Facebook petition - if you comment on Blog This Rock, they will forward to DC Advocates to the Arts] to add your name to this petition. The deadline for signatures is Thursday at 2pm. This is a NOW do this NOW kind of ask. As has been documented by local and national media, the arts community is in crisis. Now is not the time to cut arts funding. To do so would undermine all of the investments that have been made building the local arts economy over the last thirty years. The draft FY 10 budget cuts arts funding for the DC Commission on the Arts and Humanities by 37%, at the same time that private donations and foundation giving are down. Restoring funding to FY 2009 levels would give the arts community the time and confidence to leverage the city's support, and to continue serving the citizens of DC and the millions of visitors who come to the nation's capital each year. The additional money will have minimal impact on the overall budget, but it would provide great benefit to Washington's children and families, and our city's economy. In FY 2009, the 14 million dollars allocated to the DC Commission supported arts education programming for thousands of DC school children, in every ward. That same investment contributed to city tax revenue by supporting the businesses of artists and arts organizations in every ward. The council would be wise to sustain its support of the arts reflective of the value that we provide on expenditure. The city has invested heavily in the arts over the last thirty years, supporting programming and institutions. Now is not the time to undermine that progress. The creative economy can be part of the solution to the current economic and community crisis, and we ask you to: return funding to FY 2009 levels and to engage now with the DC Advocates for the Arts in a discussion to define priorities for arts spending for FY 2011. Now is not the time to slash investment that creates revenue, and supports jobs. We will present this to the city council late Thursday afternoon. The more signatures the better. If you want to really help, write your own note, and tag a member of our steering committee in it so that we track signatures. This is one reason you show in Artomatic: The notable Fraser Gallery is showing the work of ten artists which gallery director Catriona Fraser has picked out of the great hoard showing at this year's Artomatic. Absent from last year's calendar, it's good to see Fraser putting this one back into rotation. If nothing else, it's good for the health and hopefully growth of Artomatic, D.C.'s largest annual art show. Best of Artomatic, at the Fraser Gallery (7700 Wisconsin Ave., Suite E, Bethesda, Md.). 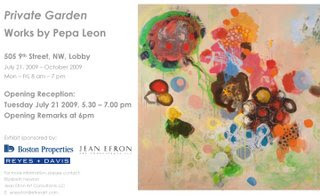 The gallery is open through August 8, from Tuesday – Saturday, 11:30 a.m. – 6 p.m. For more details, call 301-718-9651 or visit www.thefrasergallery.com. Advancing their mission to build a broad network of support for emerging artists, their ideas and work, and to further contemporary art dialogue within Washington, DC and beyond, Transformer announces the continuation of an artistic exchange with Mexico City and Garash Galeria, with the upcoming Give & Take/ Da y Toma exhibition. Following the success of the ID-entity exhibition presented in 2008 at Transformer and the Mexican Cultural Institute in Washington, DC, which highlighted the work of ten Mexico City-based emerging artists, Give & Take/ Da y Toma at Garash Galeria will present the work of five DC-based emerging artists - Holly Bass, Breck Brunson, Nilay Lawson, Solomon Sanchez, and Chakraphan Rangaratna (aka Señor Tangcito, aka Tang) - each of whom will be exhibiting internationally for the first time. The artists in Give & Take/Da y Toma are creating new, conceptual works that focus on the dynamics of exchange. Through artistic action, installation, and the creation of artist built environments, the participating artists investigate aspects of competition, fair play, ownership, equality, and stewardship. Responding to and inspired by cultural differences and similarities, the global economy, human nature and the natural environment, the artists in Give & Take/Da y Toma playfully challenge audiences to think about and interpret common and uncommon interactions. Transformer provides the participating artists the opportunity to spend ten days in Mexico City (July 22- August 1, 2009), where they will meet with peer emerging artists as well as arts leaders, install their work, engage with audiences through an opening reception and artist talks, and experience aspects of life in another federal city. Give & Take/Da y Toma is made possible in large part by the substantial award of a $20,000 grant from the DC Commission on the Arts and Humanities, with matching support from individual contributions. Featuring works by Chad Andrews… Amy Davis… Karen Hubacher… Juditha… Arpi Sahr… Melissa Widerkehr… Brian Petro… Greg Minah and Gordon Binder. Visions of New York City on an overnight trip from DC. These images of the city caught my eye. Enjoy! Copyright© 2009 Anne Marchand. All rights reserved. Tom Block will speak on his forthcoming book, "Shalom/Salaam: A Story of a Mystical Fraternity" (Fons Vitae Publisher, Louisville, KY, 2010) , which traces the virtually unknown story of Islamic mystical influence on the development of Jewish mysticism for over 1000 years. Mr. Block's talk will introduce this story, exploring how Jewish thinkers and mystics, from Moses Maimonides (d. 1204) in Egypt to the Kabbalists in Spain (13th century) and the Holy Land (15th century), turned to their Islamic cousins for spiritual inspiration, as well as specific manners of understanding the relationship with the Divine. These medieval Jewish thinkers irrevocably turned Jewish worship, meditation and synagogue practice in the direction of their Islamic cousins. By the 18th century, when the Baal Shem Tov was developing Hasidism in eastern Europe, he was attracted to the same medieval Jewish thinkers who had, in turn, depended so much on Islam for inspiration. Although he didn't realize it, his interest in specific medieval Jewish thinkers and systems of thought continued the "Islamicization" of Jewish worship, an influence which still reverberates through Jewish practice to this day. Tom Block is a writer and artist who is best known for his Shalom/Salaam Project, a scholarly investigation of the influence of Islamic mysticism on the development of Jewish mysticism, from the inception of Islam through medieval Egypt, Spain and the Kabbalah, into 18th century European Judaism and into today’s Jewish practice. He has published numerous articles excerpted from his research, as well as appearing at academic conferences around the United States and Canada. He recently presented his research at the first interfaith conference held by Al-Azhar University in Cairo, the pre-eminent religious institution for Sunni Islam. His book, Shalom/Salaam: A Story of a Mystical Fraternity, will be published early next year by Fons Vitae Publisher, Louisville KY. Mr. Block has received numerous awards and grants, including support from the Maryland State Arts Council (MD), Ludwig Vogelstein Foundation (NY), Sugarman Foundation (CA), Nelson Talbott Foundation (MD), Puffin Foundation (NJ), William and Mary Greve Foundation (NY), New York Foundation for the Arts (NY), Abrahamic Family Reunion Project (MI), Arts and Humanities Council of Montgomery County (MD) and Amnesty International (NY). Fraser Gallery lets the good times roll with a “Best of Artomatic” exhibit, open ’til August 8. Check out Fraser Gallery for the full line-up. The advice for would-be collectors is endless: Buy the best art you can afford. Buy what challenges you. Buy what makes you feel at peace. Buy from artists you know and admire. Buy work your mind revisits days after you’ve seen it. Buy with a sentimental eye. Reception: August 2, from 1:30 to 3:30 pm. The exhibit “European Prints” by Mary Ott comprises hand-pulled prints, including intaglios, screenprints, photogravures, and maybe even a lithograph. The artist’s reception will be on Sunday, August 2, from 1:30 to 3:30 pm. The exhibit will continue through August 25. Gallery hours are 9 am to 4:30 pm Monday, Wednesday, and Friday, and from 9 am to 9 pm on Tuesdays and Thursdays. The only weekend hours are for the reception on August 2. There will be a free concert the afternoon of the reception from 2 to 3 pm by “Big Jim Scotty’s Antique Song Show,” a tin-pan alley group. For recorded directions, call 240-314-5004. Artist Margaret Boozer recalls her gut reaction upon seeing the "gorgeous" polished-concrete floors of the American University Museum, where her work is on view in a stunning first-floor installation: "Oh, I need to put some dirt on these floors." Margaret Boozer: Dirt Drawings Through Aug. 16 at the American University Museum at the Katzen Arts Center, 4400 Massachusetts Ave. NW Contact: 202-885-1300. http://www.american.edu/museum. Hours: Open Tuesday-Sunday from 11 a.m. to 4 p.m.; also open one hour before performing arts events in the Katzen. Admission: Free. Heather Darcy Bhandari and Jonathan Melber, authors of the book ART/WORK: Everything You Need to Know (and Do) As You Pursue Your Art Career, talk about what artists need to know to be successful in the art world. Heather and Jonathan (a New York City gallery director and arts lawyer, respectively) will discuss business, legal and other issues artists should be aware of to help them manage their careers. Books will be available at the event for purchase and signing. Presented with Conner Contemporary Art. No Artist Left Behind is a professional development initiative created by WPA to provide resources and workshops to DC area visual artists. Shock value? That's kids' stuff. Back in Renaissance Venice, this was the ultimate challenge: create a beauty so ideal that onlookers would get emotionally involved, even fall in love. One sculptor made that his mission. "An Antiquity of Imagination: Tullio Lombardo and Venetian High Renaissance Sculpture"
Hannah Naomi Kim, Collision (Gate-State House), oil and encaustic on canvas, 70 x 84"
Located 2 1/2 blocks North of the Dupont Circle Metro Station. 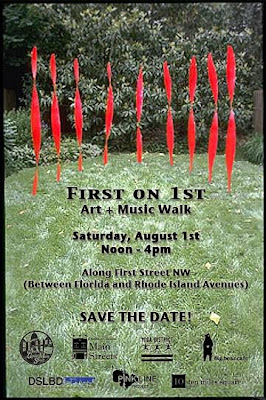 The Pink Line Project and North Capitol Main Street invite you to an Art + Music Walk in the Bloomingdale neighborhood! Along 1st Street, NW, between Florida Avenue and Rhode Island Avenue. Start at Big Bear Cafe or Windows Cafe. Free beverage for those who complete the walking tour game! Drink specials for the rest of you. Go here for list of artists and musicians. VCU's Department of Sculpture + Extended Media. “Elvis at 21: Photographs by Alfred Wertheimer,” a new Smithsonian traveling exhibition, presents 56 of these striking images and will debut at The Grammy Museum in Los Angeles Jan. 8, 2009, Elvis’s 75th birthday. Developed collaboratively by the Smithsonian Institution Traveling Exhibition Service, the Smithsonian’s National Portrait Gallery and the Govinda Gallery, “Elvis at 21” will be on view at The Grammy Museum through March 28, 2010. Following its showing in Los Angeles, the exhibition will travel to museums around the country through 2013. “Elvis at 21” is sponsored nationally by the History channel. “Elvis at 21” is accompanied by a richly illustrated catalog, titled “Elvis 1956,” available through Welcome Books. For more information, visit http://welcomebooks.com/elvis1956. Located in Washington, D.C ., the Govinda Gallery exhibits one of the largest collections of music photography in the world. Over 30 years, the gallery has organized more than 200 exhibitions of many of the nation’s leading artists. It has featured Wertheimer’s work in several exhibitions, including his first major one-person exhibition in 1997. Visit online at www.govindagallery.com. Join Civilian Art Projects for a lively, informative, and participatory artist talk with Ryan Hill, creator of the "Everything Must Go" exhibition. In his first solo exhibition with Civilian Art Projects, artist Ryan Hill curates content from the "digital museums" of Google, YouTube and Flickr and reassembles it as works on paper in the gallery space. Quoting, tracing, and drawing from internet images, the artist describes his intimate installations as "a free range of associations, from the gothic to the absurd." Using tracing and transfer paper, colored pencils, inks and gouaches, Hill draws and paints humorous, sometimes dark, and varied images of heads, skulls, castles, bubbles, and chrysanthemums. According to the artist, "I view all these as fragile and self-contained worlds floating in the abyss of the blank paper." Heads and skeletons dominate the work." "Considering a range of concepts such as growing older, mortality, and myth, Hill's inspiration for the series grew out of a personal photograph of his father "when he was staring off into space." Hill writes, "reflecting on how he was growing older, my understanding of his values and how much society stopped reflecting them back to him made me also think about myself. My father is the first iteration of Baby Boomers and myself is the last - ideas of progress, the Great Society, loving one another were constructed by his generation and deconstructed by mine. In that moment I saw that this whole social project was going to vanish with us and something we would never fully comprehend would take it's place through another generation." "Everything Must Go" will be on view until Saturday, August 8, 2009. Also on view: "Upgrade," a group exhibition featuring Andrew Brown, Lindsay Buhman, Nicholas Carr, Benjamin Chetta, Cheraya Esters, Cory May, and Anna Wonson. The DC Creates! Public Art Program at the DC Commission on the Arts and Humanities (DCCAH), in collaboration with the Washington Area Metropolitan Transit Authority, Art in Transit Program (WMATA) and the Takoma community, seek an artist or art team to design, create, and install artwork that will be located within the Takoma Metro underpass. The goal of this project is to create a vibrant and inviting gateway to the Takoma DC community. The colorful artwork will provide an “avenue” for residents, commuters and visitors to enjoy, admire and revitalize the community as well as express the unique story of historic Takoma. For more information, email Rachel.Dickerson[at]dc.gov or call (202) 724-5613. The DC Commission on the Arts and Humanities (DCCAH) in collaboration with District of Columbia Public Library is seeking East-of-the-River artists, including writers, to submit proposals for four prominent areas inside the new Benning and Anacostia Libraries which are expected to open in the spring of 2010. The proposed artwork sites provide artists and writers the opportunity to display their work in a large-scale format in a public building. For more information about the project email Rachel Dickerson or call (202) 724-5613. For more information about the libraries go to dcpl.dc.gov (DCPL Construction Projects). In these installations of unfired local clays, Boozer's graphic compositions of color, pattern and texture create small geologic events, manifestations of cause and effect celebrating clay's physical properties. Colors change, shapes warp, cracks emerge as counterpoint to the artist's hand in these fragile and mutable works that cross genres between painting and sculpture, abstraction and representation. "Shalom/Salaam: A Story of a Mystical Fraternity"
1150 17th Street NW, Suite 408, Washington D.C.
Tom Block, Mowlana Jalaluddin Rumi, acrylic, ink and collage on canvas, 40" x 30"
Tom Block will speak on his forthcoming book, "Shalom/Salaam: A Story of a Mystical Fraternity" (Fons Vitae Publisher, Louisville, KY, 2010) , which traces the virtually unknown story of Islamic mystical influence on the development of Jewish mysticism for over 1000 years. Mr. Block's talk will introduce this story, exploring how Jewish thinkers and mystics, from Moses Maimonides (d. 1204) in Egypt to the Kabbalists in Spain (13th century) and the Holy Land (15th century), turned to their Islamic cousins for spiritual inspiration, as well as specific manners of understanding the relationship with the Divine. These medieval Jewish thinkers irrevocably turned Jewish worship, meditation and synagogue practice in the direction of their Islamic cousins. By the 18th century, when the Baal Shem Tov was developing Hasidism in eastern Europe, he was attracted to the same medieval Jewish thinkers who had, in turn, depended so much on Islam for inspiration. Although he didn't realize it, his interest in specific medieval Jewish thinkers and systems of thought continued the "Islamicization" of Jewish worship, an influence which still reverberates through Jewish practice to this day. Tom Block is a writer and artist who is best known for his Shalom/Salaam Project, a scholarly investigation of the influence of Islamic mysticism on the development of Jewish mysticism, from the inception of Islam through medieval Egypt, Spain and the Kabbalah, into 18th century European Judaism and into today’s Jewish practice. He has published numerous articles excerpted from his research, as well as appearing at academic conferences around the United States and Canada. He recently presented his research at the first interfaith conference held by Al-Azhar University in Cairo, the pre-eminent religious institution for Sunni Islam. His book, Shalom/Salaam: A Story of a Mystical Fraternity, will be published early next year by Fons Vitae Publisher, Louisville KY.
Mr. Block has received numerous awards and grants, including support from the Maryland State Arts Council (MD), Ludwig Vogelstein Foundation (NY), Sugarman Foundation (CA), Nelson Talbott Foundation (MD), Puffin Foundation (NJ), William and Mary Greve Foundation (NY), New York Foundation for the Arts (NY), Abrahamic Family Reunion Project (MI), Arts and Humanities Council of Montgomery County (MD) and Amnesty International (NY). (Washington DC) This is the last chance to view art in Freshly Squeezed DC exhibit. The closing reception that will run from 6pm - 10pm on Wednesday night. Artists: Imani Brown, Adriane Connerton, DECOY, Jeremy Flattau, TAXI GANG, Shaun Gregoire, Peter Krsko, Joseph Orzal, OWEL, JP, Juan Pineda, Jeremiah Tittle, Stefan Ways, DJ Ben Silsbee. You can't help but notice that the alley at 14th and P Sts is a little more appealing lately. There's more than meets the eye in this new street art gallery. You're likely to do a double take and meander back to the eye catching visuals of Shepard Fairey and Evol. Is it art, grafitti, propoganda...you might wonder. On further exploration, you find the whole alley is plastered and painted with murals. And if you somehow miss the alley gallery, you can pop out the back door of Irvine Contemporary and be treated to the variety of the wall murals produced by the Street/Studio artists. Inside Irvine Contemporary, the artists have produced work that reflects their street styles. Evol creates urban architecture on cardboard, one of the materials of choice by several of the artists. Don't be fooled.... beautiful pieces are created on these humble materials. There's a freshness, a vitality and an urban savy that the artists bring to this work - nervy, edgy and perhaps easier for some to absorb in bite size pieces. Don't miss it! Go see for your self. There's a great article by Jessica Dawson in the WaPo on "Street/Studio" at Irvine contemporary Gallery. Missed the opening night? Not to worry. You can get a look at the production of the murals & see the artists at work onsite and the opening night by visiting Irvine Contemporary's Website. Slide Show Artists, Wall Murals, On-Site Projects, Works in the Exhibition at Irvine Contemporary. Play games and win prizes! 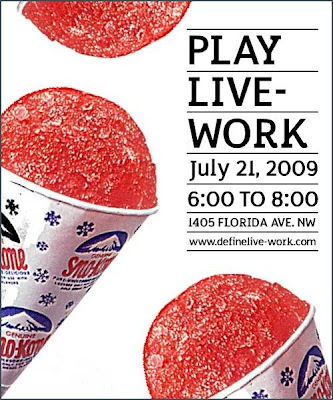 Eat sno-cones and drink cool beverages! Think of ideas on how a cool live-work space can be used as both a home and workplace! If your idea wins, you get $500! And the winning idea will be staged in the Solea condo live-work space! How do you win? By getting all your friends to vote for your idea! Submit ideas by July 24. Vote between July 24 and July 31. Submit and vote at Define Live-Work. DJ Gold (The Fridge DC). Ring Toss, Krazy Kans, Big Mouth Toss, and Skeeball. Heavy Hitterz, an annual group art show that features emerging artists from the lowbrow and graffiti art scene, is heading to Art Whino Gallery in the Washington DC Area for a July 25 opening. Presented by gaNyan, Art Whino, and fabric8, this third annual showcase of emerging artists will feature 60+ international painters and illustrators from around the globe including Josh Taylor, Angrywoebots, MUNKONE, Ursula Xanthe Young, Estria, Phoneticontrol, and Stuter. The concept for the show was first developed and executed in 2007 by curator gaNyan, who wanted to bring together the up-and-coming artists he admired in the character-based and underground art world. It debuted at Age Song Gallery in San Francisco with over 80 participants and much acclaim. In 2008, Heavy Hitterz Manila was presented in the Philippines at Pablo Gallery, complete with a block party featuring live painting and DJs in the streets. 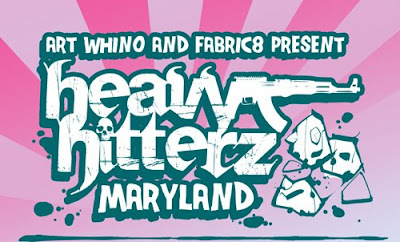 For its third installation, gaNyan teams up with Art Whino and long-time collaborators fabric8 to bring Heavy Hitterz Maryland. All three have been long committed to the street art scene and are excited to join forces from West Coast to East. Adamson Gallery presents "Romanticism," an exhibition of new photographs by Lou Reed - stunning black and white images of landscapes and architectural motifs, shot on the artist's travels to Scotland, Denmark, Big Sur and elsewhere. The photographs are taken with a digital camera that Reed had adapted to "see" in the infrared zone, which gives them as aura of strangeness, or otherworldliness. They have a timeless quality but are simultaneously very modern, like Reed himself. They are surprisingly small in scale, making these striking natural images personal, portable, and intimate. First with his group, The Velvet Underground and then as a solo artist, Lou Reed has been making innovations in music since the 1960s. His name has become synonymous with the New York avant-garde, and with the city itself. With his photography, Reed has been moving out of New York, while his first collection featured portraits of the city, this new one focuses on more pastoral settings. This collection of photographs takes its name from the 18th and 19th century art movement that sought a return to the emotion, beauty, and unknowability of the natural as a counterpoint to industrial era's emphasis on technological development and the pursuit of rational knowledge. Reed's images recall this impulse: they focus on the aesthetic and the sublime; the splendor of a single tree against a cloudy Scottish sky, suffused with light. There is, however, also something uncanny and eerie about some of the photographs; the absence of human figures, a road leading over a bridge into a dense, shadowy forest. Reed has recently adapted the poet and writer Edgar Allen Poe's The Raven, the supernatural is a theme that underwrites much of his recent work. Perhaps, like the Romantics, Reed is commenting on another Industrial Revolution - the rapid developments of globalization are once again placing the natural into both literal and metaphoric danger - the beauty of his landscapes takes on a more urgent meaning. Reed says of his work, "I love photography. I love digital. I love digital. It's what I'd always wished for. Being in the camera and experiencing the astonishing accomplishment of the creations of life sparked through the beauty of the detailed startling power of the glass lens. A new German lens brings a mist to me. The colors and light I come to see through the beauty of the camera. A love that lasts forever is the love of the lens of sharpness - of spirit warmth and depth and feeling. It makes my body pour emotion into the heartbeat of the world. A great trade and exchange. I think of the camera as my soul. Much like a guitar. My lovely Alpa has rosewood grips. What more could you need?" Lou Reed has been working in multiple media for over thirty years. Along with his band, The Velvet Underground, he was inducted into the Rock 'n' Roll Hall of Fame in 1996. He has acted in and composed music for a number of films, and is the recipient of the Chevalier Commander of Arts and Letters from the French government. He is the author of Pass thru Fire: The Collected Lyrics and the play The Raven. His previous books of photography, both published with Steidl, include Lou Reed's New York and Emotion in Action. The Art Registry Presents at THE GALLERY at Todd Christofaro. After returning to DC from a trip to NYC, I had to go see Erin Chase Mackay and Jill Lubar's NEW Art Registry Gallery opening in Georgetown tonight. This is the gallery's second opening and features the paintings of Brent Lilly. The gallery is located at 3146 Dumbarton Street, NW in Georgetown above Todd Christafaro. Brent Lilly discussing his work. DC's International Arts and Artists’ Hillyer Art Space is currently accepting submittals until July 31st, 2009 for its regional artists series of exhibitions beginning January through December 2010. - Artists must be currently living or working from the Mid Atlantic Region (MD, DE, WV, VA, & DC). - Artists seeking a solo show at Hillyer must not have been featured in a solo show in DC area within the last 10 years. - All work to be included in Hillyer Art Spaces shows must have been made in the last 5 years. 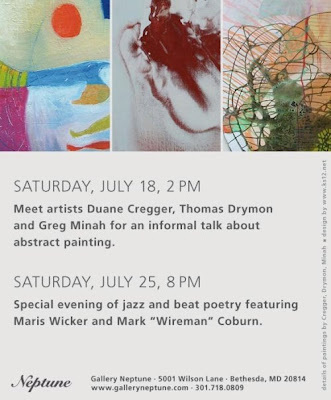 For details and prospectus, please email Graham Boyle at grahamb[at]artsandartists.org or call the gallery at 202.338.0680. Are you looking for art and artists in the Washington metro area. You can have the pulse of the artscene at your fingertips with a copy of the WPA Artist Directory. Published bi-annually, this four-color, 5.5 x 8.5 inch Directory is the definitive listing of established and emerging contemporary artists throughout the Washington region. The Directory showcases the work of 400 artists on beautiful semi-gloss pages in full color. Contact information on each artist is included for art professionals and art lovers to utilize in building their roster of artists or private art collection. This Directory is a great addition to any art library and a great gift! July 22nd, Wednesday, at 6:30 to 7:30. Thomas Drymon will discuss his exhibit Waiting for the world to begin and how he integrates the themes he explores in painting to photography, video and installation. He also will comment on his work as a commercial graphic designer and its influence in his work. Slides and short films will illustrate the talk. Drymon is a painter and photographer living in Washington, DC. In Waiting for the world to begin, the artist meditates on man's relationship to the natural world and his search for beauty amidst the rubble of daily existence. The works reflect moments in time - sometimes light and playful, sometimes dark and dense - but always isolated, with no hint to the past or future. Special guest host Simone Jacobson, the founder and original host of HOME. Jacobson was born in Phoenix, Arizona where she emerged as a performer under the tutelage of internationally renowned choreographer, Hodgie Jo. While at the University of Maryland, she studied dance and became a member of the professional hip-hop dance company, Culture Shock DC (CSDC), serving as the first director of their junior dance company, Future Shock. Jacobson was the founder/director of the Urban Poets Society, a traveling collective of spoken word poets in DC, MD, and VA. She also founded/directed UMD's first hip-hop dance company, PHUNKtions, which is still active and hosts an annual hip-hop dance competition. Today, Jacobson is the Director of The Cipher at Words Beats & Life, a non-profit organization dedicated to transforming individual lives and whole communities through hip-hop. She is also pursuing an MA in Arts Management at American University. New Orleans, Louisiana-bred hip hop artist, spoken word poet, host, screenwriter and high school teacher Drew Anderson, aka "Droopy the Broke Baller," utilizes his talent in innovative ways to connect with audiences big and small via the avenues of art and education. A fixture in the D.C. spoken word scene for more than 10 years strong and two-time DC/Baltimore National Slam Team member, Anderson has a writing resume that includes two solo publications and numerous collaborative projects. He is a co-founder of the award-winning Straight, No Chaser Productions film company, dedicated to giving voice to underexposed characters and lending reality to unconventional worlds. As a performance artist and host of the ever-popular "Spit Dat" set at Mocha Hut, Anderson is known lovingly as "The Black Weird Al Yankovich" for his laugh-laden parodies of the music world's catchiest contributions. We are fortunate to have him as our feature this month, as he was contemplating running for president but decided instead to "give his boy Barack a shot." A mixed media exhibition juried by F. Lennox Campello. Frida Kahlo remains one of the most influential artists of the 20th century, but her spectacular life experiences, writing and views on life and art have also influenced many artists. Frida always painted herself: her pain, her anguish, her sorrow, her passion, as well as her triumph over disability. Her paintings and retablos celebrate a life constantly reinventing itself, in spite of the physical disability that strove to confine it. This exhibition will showcase the work of artists influenced not only by Frida’s art, but also by her biography, her thoughts, and her writings. On July 8, the Corcoran Gallery of Art’s exhibition space dedicated to the Corcoran College of Art + Design, Gallery 31, will open the three-part show A Priori/A Posteriori. The show contains work from current students and recent graduates, and is the result of an experimental class conducted in the spring 2009 semester, taught by Professor Margaret Adams. The show was created around a single concept decided on by the class. A Priori/A Posteriori concept explores the root of ideas and knowledge based on perception, instinct, implicit and explicit memory. A priori suggests defining ideas as inherent, while the posteriori identifies learning through the act of experience. The discovery has been that the group’s work speaks from a central point, or slash between, the priori and posteriori process. Instinct: July 8 – July 11. Opening July 9 from 6 p.m. – 8 p.m.
Time: July 15 – July 18. Opening July 16 from 6p.m. – 8 p.m. Vision: July 22 – July 25. Opening July 23 from 6 p.m. – 8 p.m.
Gallery 31 is located at the New York Avenue entrance to the Corcoran Gallery. Hours are from 10 a.m. – 5 p.m., Wednesday – Saturday, and until 9 p.m. on Thursdays. Admission is free. For additional information about Gallery 31, or for more information about the college, please visit www.corcoran.org. Source: Daily Campello Art News. The Brown Foundation, Inc., of Houston. Visceral paintings in Paint Made Flesh inspire the physicality and emotional charge of new choreography by Kelly Mayfield, artistic director of Contradiction Dance, where theater, dance, and pop culture meet. As seen at Round House Theatre and Artomatic. Events listed above at the Phillips are in conjunction with the exhibition Paint Made Flesh, organized by the Frist Center for the Visual Arts, Nashville, Tenn. This exhibition is supported by an indemnity from the Federal Council on the Arts and Humanities. Talk About Art is a six-minute documentary film that highlights the views of visitors to the National Gallery of Art. Among those who share their thoughts on art are people from all walks of life—including (printmaker Lou Stovall), students, a taxi driver, an architect, a security guard, and a hairdresser. These are not art historians, but art is a common bond for them, and clearly a force in their lives. For some, art is a way to connect to the past; for others, it is a way to see the world around them in a different way. Listening to their side of the museum experience may get you talking about art as well. IMPORTANT NOTE: WPA is no longer accepting exhibition proposals for the 2009 season, but there are slots still available for programming, performances and events. Washington Project for the Arts announces its new artist-run series, COUP D'ESPACE. Channeling their roots, this program celebrates the WPA's new location and launches it as a dynamic space for thought provoking, art-minded events. Artists and curators are invited to submit proposals for a veritable 'take-over' their office space. This call is intentionally vague so as not to shape or limit the types of submissions. For questions on any of these programs, contact Kristina Bilonick, Program Director at kbilonick[at]wpadc.org or by calling Kristina at 202-234-7103 x 2. Tragic news on the death of Desi Deshaine, the press secretary to Ward 2 Council member Jack Evans. Condolences to his family. NBC 4 reports that Desi's body was found in Baltimore Harbor. Edward Winkleman has a new book out which should be of interest to galleries and artists alike. Make a beeline for these 24 pages. Nothing takes the mystery out of the submission process better than learning how a dealer puts a roster together. Here's how Ed found/finds his artists, in order of frequency: "recommendations (including from other dealers), institutional exhibitions, open studios, cold call submissions." In other words: show, show, show, show and network, network, network. This goes along with what I know of dealers. Their websites may say "No submissions accepted at this time," but they are always looking. As for cold-call submissions, they are, confirms Ed, "the least productive means of finding suitable artists." If you must go this route, do your homework. "Every now and then an unsolicited submission will make your day. Either the artist has done his research and knows his work is a good match for your mission, or fate smiles on you." Washington, D.C. has no finer artist representative for quality and passion than Manon Cleary. For more than thirty years, Ms. Cleary's often disturbing drawings and paintings have brilliantly represented her personal world in provocative, unflinching and iconic terms. A 2008 exhibit at the Kalamazoo Institute of Arts referred to Ms. Cleary as "one of the leading American figurative artists of the past three decades". This exhibit at Addison/Ripley pairs gentle sky "portraits" with pictures of strangely engaging white rats. Each of the works from Rats and Skies, is developed by hand on sanded paper with an unmatched mastery of materials and technique. In addition, the gallery will present earlier work by the artist, including examples from her "Movement Series". Ms. Cleary was born in 1942 in St. Louis, Missouri and is included in museum collections from Washington, D.C. to New York, North Carolina, Virginia, Arizona, Wisconsin and the United States Embassy in Lima, Peru. In addition, the artist has exhibited throughout the world including such countries as Russia, Malta, Kazakhstan and Denmark. Her contribution to the art world in Washington is extensive and ongoing despite recent health issues that have limited her ability to work. Rent out Govinda at National Harbor!